This post is adapted from an article that originally appeared in The Seattle Times. 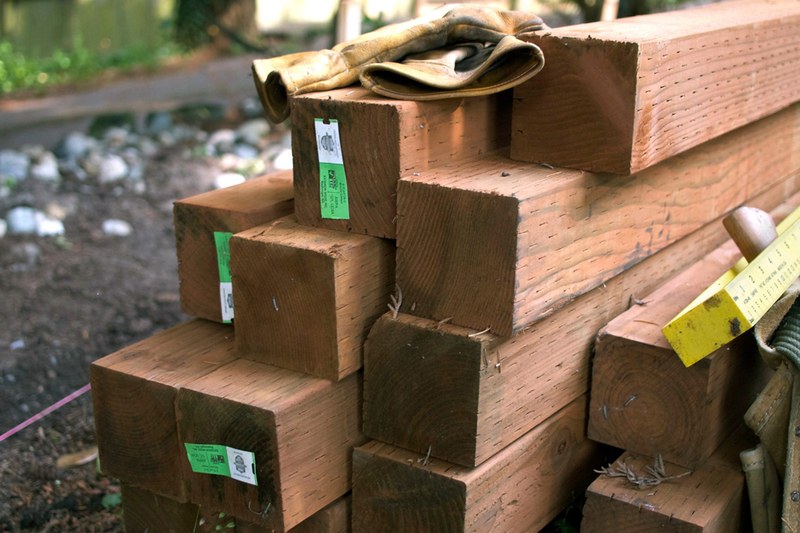 If you want to build a cedar fence from the ground up, check out our simple tutorial from master carpenter Daniel Westbrook. This time of year in the beautiful Pacific Northwest, our focus drifts toward outdoor projects and we spend more time outside. A fence may be weathered and gray, but can still last for many years before full replacement is needed. If your fence is leaning significantly, it may be that a post has rotted and a simple post replacement is all that’s needed. Here’s how to replace an anchored post on a standard wooden fence. To get to the post and provide working room, it’s necessary to remove the attached fence sections. First, remove all fence boards within 12 inches of the post. This will also need to be done at the next post on either side of where you’re working. Next, use a Sawzall or other reciprocating saw with a blade for cutting wood and nails. Insert the blade between the post and the section rail, and cut the nails off. Do this at the post you’re removing and at the post at the far end of the sections. Remove the section and set it aside for reinstallation. Removing the old post base is a matter of digging it out. Soaking the ground with water may assist in the removal process. If the post proves difficult to remove, try driving large nails or screws into the base of the rotten post and use a two-by-four as a lever to pry it out of the ground. Existing concrete should come out with the rotten post, or crumble during the process for easy removal. 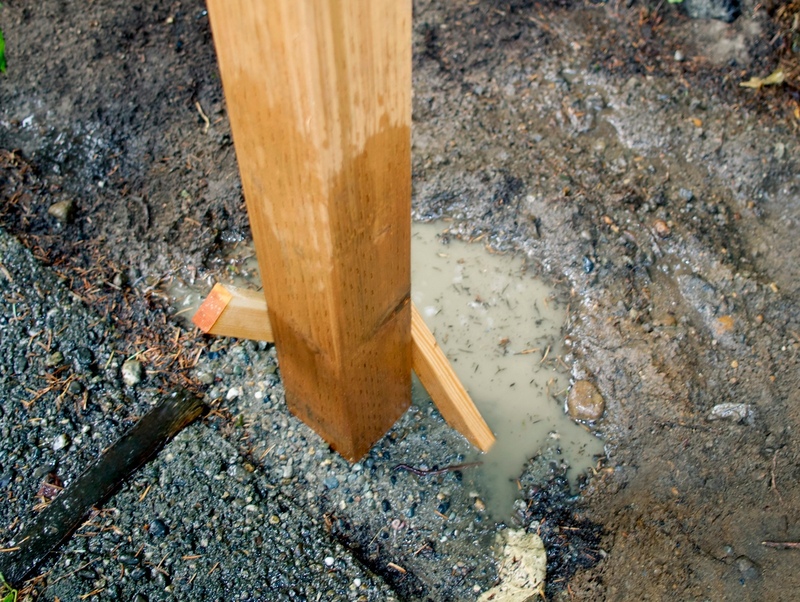 The new post should be the same size as the rotten post, with a pressure-treated, ground-contact wood used. Make sure the new post rises above the top of the fence; it can be cut to size later. Pour a few inches of gravel into the bottom of the hole and tamp. Reinstall one of the sections using 3" outdoor screws through the side rail and into one of the existing posts exactly where it was positioned previously. (This is easier to perform with two people.) Then set the new post at the bottom of the hole against the section rails and secure the post to the section with screws. The new post is now positioned exactly where it should be and won’t require measuring. Take the next section and situate it between the old and new posts. The new post won’t be stable, so have a helper hold it in place. If you're using gravel only to secure the post in the ground, fill in layers and tamp each layer solid as you go. Premix concrete bags are also commonly used to secure posts. You can mix the concrete outside the hole and pour it in, or mix it in the hole by adding dry mix and water to the hole. Mix with a stick as necessary to moisten the mixture. Cut the post at the height needed, reinstall any existing fence boards, and remove the bracing once the concrete is set. Whenever you trim a piece of pressure-treated lumber, coat the fresh cut end with wood preservative to maintain the integrity of the treatment. Finally, backfill the top of your hole. The replacement is now complete. Posts are a crucial part of any fence, and this simple replacement technique will keep yours going for the long term—so you can enjoy your yard and the outdoors even more. Most of us who are in the trades spend years perfecting our craft, but we can't forget that in order to succeed we need to spend equal time building our business acumen. Learn everything you need to know about custom stone countertops, from choosing the right stone to installation day tips.